Travel deep into the mysterious jungle of the Lost World! The nefarious treasure thief Jacques has kidnapped another damsel, and it’s up to you to stop his evil plans before she is sacrificed at the spooky full moon ritual. 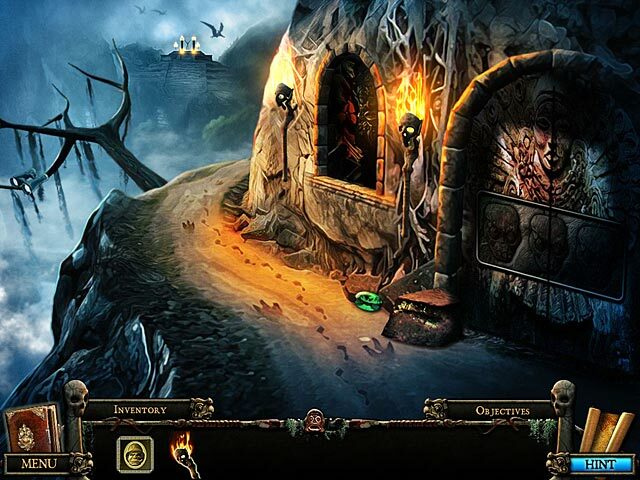 Journey through haunted ruins and diabolical traps on your quest to find the secret Golden Treasure, and unravel the mystery of this epic adventure before it’s too late in this exciting Hidden Object Puzzle Adventure game! There are several characters in this game : Anna is the heroine, the female professor is the victim, there's an evil scientist/explorer, Lord R. who seems to get into trouble, and a few others. It's rather interesting to see how they interact with each other. There are a lot of hidden object scenes to work through. 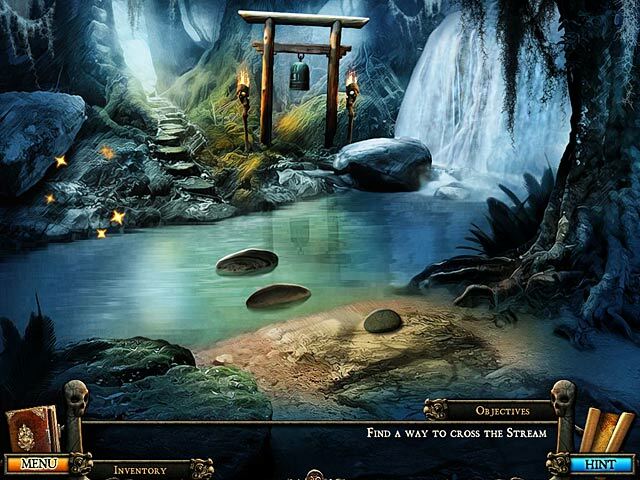 Most objects are able to be found without using the hint button. A few of the puzzles were a bit challenging and took a while to complete. There is a hint section that will let you know what you need to be looking for to complete some of the tasks. I didn't like how you had to go back and forth to different locations to find some of the things that were needed. Fortunately, there is a map that can take you to places quickly. The game took me quite a while to finish, probably 6 hours in all. I did spend time though looking a the graphics, so other players would probably be able to finish sooner. Overall, an enjoyable game. On a journey deep into the jungle of a lost world a dastardly treasure thief has kidnapped a female professor and it is intended that she be sacrificed. Anna, who the despot is desperately trying to appeal to her affections, must rescue the professor before it is too late and recover the secret treasures. I found this game to be extremely involved and challenging with lots of back tracking and retracing of steps in an effort to solve intricate and multi facet puzzles most of which involved travel to a number of different parts of the jungle to set various parts in action to solve the whole puzzle. The hint button was more than useful in detailing all the steps necessary to complete the tasks and where to look for the clues, but this still made for a very challenging game which seemed to take forever to complete, but I thoroughly enjoyed the whole experience. I did not need to consult the walk through blog as all the help required was available in the hints. The dialoge was adequate and helpful and the graphics were very good, detailed and clear. 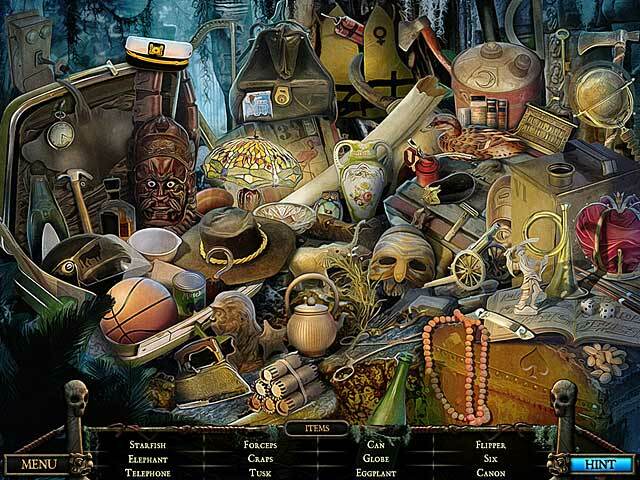 There were lots of hidden objects scenes but these did not need too many hints but some of the puzzles were real doozies. A great game, needs patience and thought, but I thoroughly recommend it. Like previously said, wasn't expecting that much. Graphics are cartoons, but perfectly suits the game, reminds of old 60/70s adventure cartoons, maybe Indiana Jones style. But then boy was this fun. Many hours of can't leave the computer. Many characters adds to the world, many things to do, many surprises, a jump map very useful but sometimes I liked to go to places the long way so visiting this world and maybe discovering new clue/tool/object. Is in my top 10 best games list. I generally don't give 5 stars, reserved for exceptionally good games. This one gets a 5. After this I got Hide & Secret 3 Pharaoh's Quest, was ok but this one was better. Totally recommend. I just got around to trying this game after reading it as another reviewer's favorite games. I really appreciate when reviewers put a mix of different games in their favorite games as it gives me a chance to go back and check out these older games. This one was a winner. Easy HOS, quite a few. Lots of puzzles. Very very helpful hint button, and I did need it. Transport map, but does not show if a task is needed or not. You carry around lots of inventory. You even carry around people in your inventory. A lot of back and forthing. And I do mean A LOT :) More of an adventure game. A very very long game. Very challenging and required use of the old brain cells. I highly recommend. I liked this game, but I didn't like the that you had to go back and forth to find things all the time. And there was some minor errors with the jigsaw puzzles. But all in all a very good game. I start playing this game with no much expectation but I got a nice surprise. I play my games in the order I buy them. I'm still playing games I bought in June 2011 so this game is an old game. The game was very entertained. I love the graphics, the music and the storyline. The map was very helpful to take me to one place to another but I loved to wander around too. Although I tough it was kind easy I was stock in finding what to do next because it has lot of places that you have to visit, this is when either the Hint or going from place to place in the map help you to find what you're looking for. The hidden objects where somehow easy to find. Gameplay took 6 ? - 7 hours. Game was much more challenging than I thought it would be. Although this is another ?people crashed on an island? game, the plot did get more complicated. There are 20 locations and plenty of things to do. You are frequently looking for several things at once ? at one time, you have 12 things to find for different reasons. There is an interactive map ? you?ll frequently need to go back to a scene later to complete it. Your tasks may mention a location. So, when you are in a new location, I suggest you look at the map to see where it is on the map, because locations are not identified by name and the illustrations clearly identify only a few locations. (There are several village and lake locations, for example, so it helps to know where they are specifically.) HOS and inventory: HOS are moderately challenging, but items are identifiable and nicely sized. Even people you find go into inventory. Some inventory is used well after it is found. You will also encounter situations where you need an inventory item, but will not be able to get it until quite a while later. So you?ll always have several things going on at once. You do have a journal written after the fact like most, but it is helpful in solving a few puzzles. If outside of the HOS, the hint system will tell you what to do and usually in what location; it?s almost like having a strategy guide. But you need to know where those locations are, so see my comment above. Otherwise you?ll be aimlessly backtracking quite a bit. Graphics were good, except that the people looked waxlike. Puzzles are varied and many were more of an adventure than your typical puzzle. Music was appropriate for the game. I REALLY enjoyed this game because it was very interactive with commonsense tasks but why all the other characters? All the guys did were 1 task each throughout the entire game and was almost worthless in assisting the heroine -- actually made more work for her to do; hmmmmmmm Each task that you performed built the next step and the next and basically made it a worthwhile -- with no hair pulling -- complex but easy game to play. I enjoy playing games wherein you can use inventory items that make sense to the task at hand as well as have a hint button that CLEARLY explains the next step(s) necessary to continue on in the game -- if you get stuck. I've played about 100 BF games, HO and Adventure. This was fun and relaxing, not too hard. The map is a big help so you don't have to back track.